Ann's readers can share the love. Last week, Pat shared links to three great free valentine designs in her blog. This week, I have another one I've been working on. Actually, two. 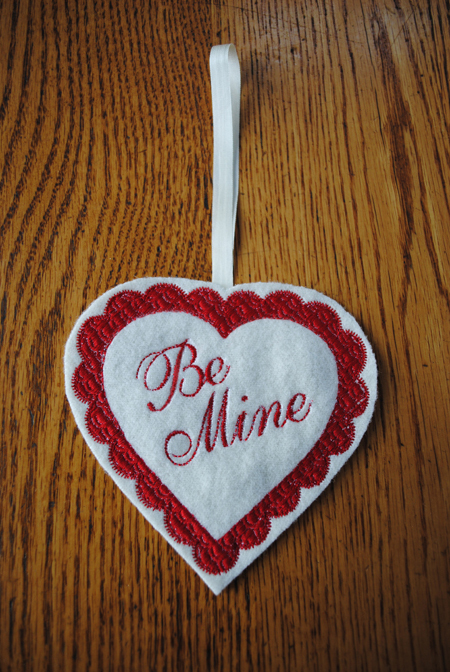 This valentine heart is another of Ann's designs. I particularly liked it because of the scalloped edge. 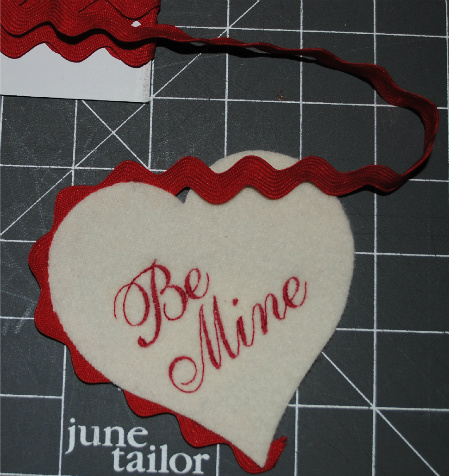 I removed the center design and added my own text-Be Mine-in an elegant script. You can do the same with Catalog Xpress and Alphabet Xpress. Hoop an adhesive tear-away stabilizer and finger-press felted wool in the hoop. The design was stitched in red cotton thread. My choice of wool felt is Marcus Brothers. It is extremely soft (70% wool and 30% nylon), but hard to find. My source? The Stash Store. After removing it from the hoop, carefully tear the stabilizer away and cut around the outside of the heart, leaving a bit of wool around the outside. Attach a hanger, and it's a unique valentine. 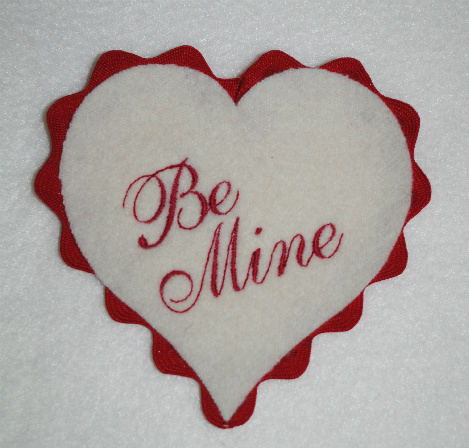 The second valentine is a felt heart shape with Be Mine embroidered in the middle and a row of rick rack around the outside edge to create the scallops. The AccuQuilt GO cutter makes the process effortless. 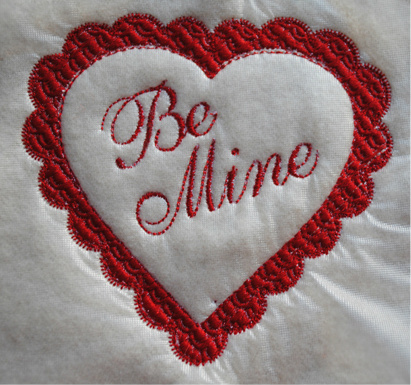 Using the AccuQuilt 55029 die, cut a four-inch heart, hoop an adhesive-backed tear-away stabilizer, and finger-press it in the center of the hoop. Stitch out the text of choice (it could easily be a monogram) and remove from the hoop. 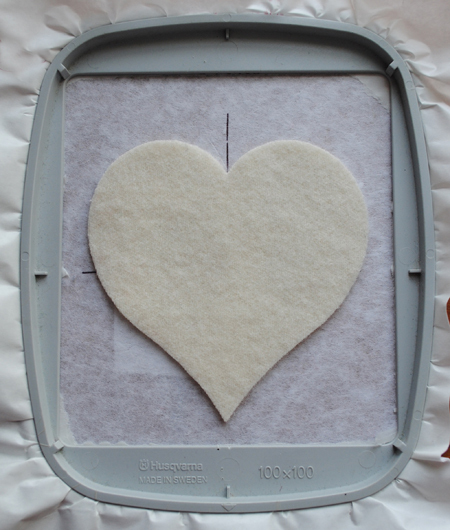 Carefully tear away the stabilizer and glue the rick rack around the outside of the heart, fitting it to the curves. Attach a hanger and you have another special valentine. Excellent tutorial and innovation! I enjoy seeing an embroiderer take something terrific and make it their own. Not only do we have beautiful designs available, but we can adjust and nudge them to suit our tastes. Sewblest, your eye for interesting things is excellent. Thank you, Pat! I'd love to hear what our readers would like to see in upcoming blogs. Any suggestions?